Carpal tunnel receives its name from the eight bones in the wrist, called carpals, which form a “tunnel” through which the nerve leading to the hand extends. The carpal tunnel is filled with tendons (bundles of collagen fibers that attach muscle to bone) that control finger movement. Tasks requiring highly repetitive and forceful movements of the wrist can cause swelling around the tendons, resulting in a pinched nerve and producing CTS. Trauma, certain diseases, and pregnancy may also trigger CTS. On rare occasions, CTS may be genetic (some patients with CTS have carpal canals that are narrower than average). People who have short and wide hands with square wrists may also be at increased risk of CTS. The nerves in the arms, wrist and hand all come from the neck. There are 8 pairs of nerves in the neck and three pairs of nerves in the upper back that supply the shoulder, arms, wrist and hands. Today, a great number of people are working at a computer or using hand held device all day long. They develop a condition that has become to be known as TECH NECK. It starts with soreness and tightness in the neck and upper back from looking down or sitting in the chair typing all day. The neck soreness and tightness turns into shoulder and arm pain with numbness. Eventually, night time numbness in the hands and arms becomes a common event followed by chronic pain in the hands and wrist. This condition is due to irritation to the nerves in the neck not the wrist. This is very similar to sciatica causing radiating pain down the back of leg with associated weakness. Surgery: Surgery is the most form of treatment for carpal tunnel syndrome. Patients are often told that success rates are high (over 90%) for Carpal Tunnel Surgery when they visit the surgeon’s office. A closer look at what and who considers what is a success is very important. Carpal Tunnel Release Surgery is one of the most performed procedures in medicine. Almost everybody knows somebody that has had it. It is one of the quickest and easiest surgeries to perform so it is a good money maker for the surgeon and the surgical center. Surgeons will often define success for a surgical procedure very differently than how patients define success. Surgeons typically will call a surgery successful if any of the original symptoms are eliminated immediately after surgery or if there are improvements to the condition. By this standard, Carpal Tunnel Release Surgery yields high success rates, because once the Transverse Carpal Ligament is severed, the pressure on the Median Nerve is eliminated and some of the original symptoms are usually relieved. To a patient, if only some of the symptoms improve, but not all of the symptoms, the surgical procedure is not considered a success. C.T surgery recovery can take anywhere from 6 weeks to over a year to regain some of the basic functionality with painstaking rehabilitation programs and a lot of downtime. Patients report permanent tenderness over the point of incision for years after surgery and permanent loss of grip strength for years. These are issues they were not told about before surgery and so it causes frustration, misunderstanding and a lack of trust in the system. The fact is some surgeries work great and others do not. The best course of action with any condition is to start with the most conservative cause of treatment before considering surgery. 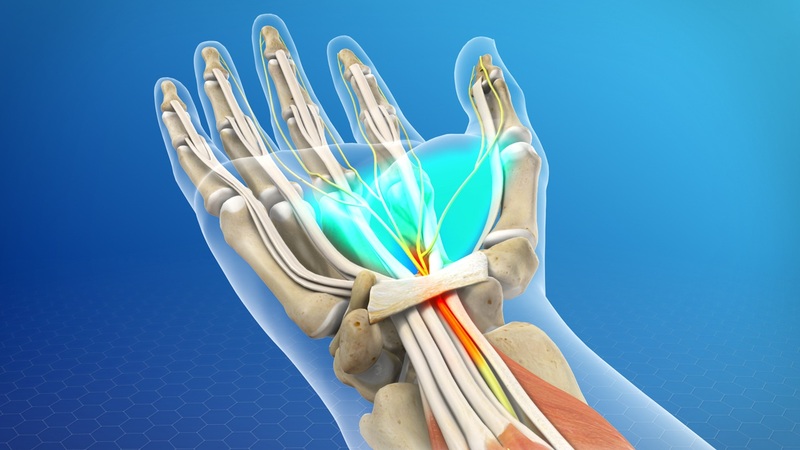 Chiropractic treatment for carpal tunnel symptoms(CTS) has been found to be very successful. What is not well known is CTS is commonly treated by chiropractors long before it was referred to as carpal tunnel syndrome. The methods most chiropractors use to treat CTS include manipulation of the cervical spine, upper thoracic area, wrist, elbow, ice, ultrasound therapy, and wrist supports. Two studies support the use of chiropractic treatment for CTS. In the first study, 25 individuals diagnosed with CTS reported significant improvements in several measures of strength, range of motion, and pain relief after receiving chiropractic treatment. Most of these improvements were maintained for at least 6 months. New research into carpal tunnel syndrome has revealed that the pain it causes in the wrist and arm is likely just symptomatic of problems in the cervical spine and upper thoracic area. Results showed that wrist and arm pain was related to misalignments of bones, ligaments, and muscles in the neck. Another study looked at the ranges of motion for 71 women with carpal tunnel syndrome when they moved their necks. When the data was compared to the ranges of motion in the neck for women without carpal syndrome, it was found that women with carpal syndrome had significant limitations and restrictions to their neck movement. In fact, the more severe the pain in the arms and wrist were from carpal tunnel syndrome, the more restricted was the motion of the neck when it was flexed towards the side of the body most affected by carpal tunnel syndrome. For women with just moderate pain from carpal tunnel syndrome, bending the neck towards the side of the body experiencing carpal tunnel pain was much easier. The results of this study only confirm something that chiropractors have known for decades: carpal tunnel pain can have its origins in the upper spine, not just the arms and wrists. The chiropractic approach to treating carpal tunnel syndrome is much less intrusive than surgery. Their focus will be on the upper back and neck where the nerves of the arms and wrist exit the spine. In treating carpal tunnel syndrome chiropractors have a range of therapeutic approaches from spinal adjustment to trigger point therapy, and prescribing home exercise to advice on how to avoid further injury. If you continue to do what caused the problem, the problem will persist. Before you consider surgery, consider your condition may be caused by your neck and a chiropractor may be your best solution for your long-term health.